HeyPlantMan! Exotic Tropical Plants from St. Pete FL: Regular market Season coming to an end, but Summer Market coming ! Regular market Season coming to an end, but Summer Market coming ! Beautiful Epidendrum Orchid ! 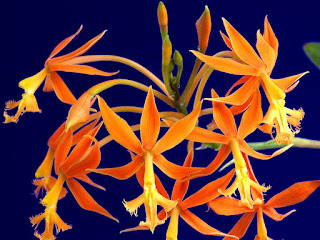 One of the most easiest orchids to grow and such long long-lasting color for such a small thin stem. They can take full sun to shade and can grow as a ground orchid, put in containers, or as Mitch loves to do, just stick that stem in the hollow of a tree and it will thrive! We are winding down the regular market season and have to take a breather from Sat. Morning Market this coming weekend (May 19), so we can get ready for the final day of the regular season of market at Al Lang Field, which is Saturday, May 26th. We will have a large, beautiful display of plants that are eager to find new homes. Then, it's off to Williams Park, downtown St. Pete for Summer Market. The park has undergone quite a rejuvenation and the setting, with large oak trees for shade, is perfect for the summer market. The Summer Market begins, Sat. June 2nd, and Market hours are 9am-1pm. We will participate, along with many other regular market vendors, so come on down to get you fill on great produce, yummy food, crafts, and of course, us ! The park lays between 3rd and 4th streets north at 1st avenue north. There is parking on the surrounding streets and the park is a safe place to walk around, enjoy the market and our warm summer days under the Oaks. Mitch and I have been working hard to renovate our own landscape and I must say, that all that shoveling and spreading of new gorgeous, red mulch in to the garden beds, really helped, and Mitch was a trouper to get it done, although the heat was a beast to deal with. His Spring veggie garden is kaput for now, but he is already planning his summer veggie garden and hopefully, by rotating our crops, we will put that dreaded strip of land between the sidewalk and roadway (that many of us have to deal with, ugh! ), looking better and better. We already have some perennial peanut in and are going to use more Mimosa groundcover, as it has proven to be a winner down at the Nursery property. Next up? Getting rid of more grass that we don't need to throw time and money and water into, and making new "islands and walkways" to have room for our ever-expanding personal plant collection ! All for now, we hope everyone has a sunny, relaxing weekend, and we look forward to seeing you at the Market for our last regular day on May 26th and the Summer Market, starting in June.